The Birth, Life and Acts of King Arthur, of His Noble Knights of the Round Table ... Le Morte Darthur ..
J.M. Dent, 1909. 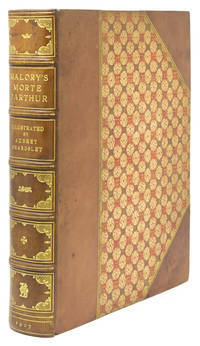 One of 1500 copies, in a modern decorative binding of green morocco leather with an inlaid frame of maroon leather embellished with inlaid dark blue leaves and vines to both upper and lower covers, three inlaid leather panels to spine, one with title, top edge gilt, other edges untrimmed. Frontispiece, plus black and white details and plates throughout. Edges a bit dusty, otherwise a fine, handsome copy. . Second Edition. Full Leather. Fine. Illus. by Aubrey Beardsley. Quarto. Le Morte DArthur The Birth Life and Acts of King Arthur of His Noble Knights of The Round Table their Marvellous Enquests and Adventures The Achieving of The San Greal and in The End Le Morte DArthur with the Dolourous Death and Departing Out of This World of Them All.<br />The text as written by Sir Thomas Malory and imprinted by William Caxton at Westminster the year MCCCCLXXXV and now spelled in modern style. With an introduction by Professor Rhys and embellished with many original designs by Aubrey Beardsley. MDCCCXCIII. 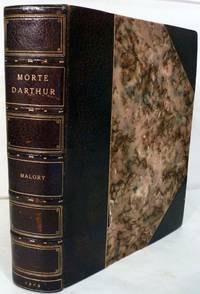 Le Morte D'Arthur: The Birth Life and Acts of King Arthur of His Noble Knights of the Round Table and Their Marvellous Enquests and Adventures The Achieving of the San Greal and in the End Le Morte DArthur [2 volumes]. London: J M Dent & co, 1893-1894. First edition thus, complete in two hardback volumes, limited to 1500 sets. 8vo (25cm by 20cm), xc, 990pp. Illustrated throughout by Aubrey Beardsley, including 20 plates (correct as per list). Original grey cloth, gilt decoration to the spines and the front boards. Bindings a little rubbed and dusty, light stain to the rear board of volume 1, endpapers browned, bookplate to the front pastedown of each volume. Overall, this set is in good plus condition. This was Beardsley's first major work, and remains a classic of Art Nouveau book illustration. The Birth Life and Acts of King Arthur of his Noble Knights of the Round Table Their Marvellous Enquests and Adventures The Achieving of the San Greal and in the end Le Morte Darthur with the Dolourous Death and Departing out of the World of them all. BEARDSLEY, Aubrey (illustrates). MALORY, Sir Thomas. J.M. Dent, London., 1909. Second edition. pp liv, 624. Out of a total edition of 1500 copies this is one of 1000 issued in Great Britain. Introduction by John Rhys. Note on the Text by F.J. Simmons. Reprints Caxton's Preface, Introduction and Table or Rubrysshe of Contents. 20 full-page illustrations, chapter headings, borders, ornaments and other decorations by Aubrey Beardsley. Small quarto. Later binding by Bayntun of Bath of three-quarter green morocco with raised bands, gilt devices and rules to spine, green cloth sides, marbled endpapers, top edge gilt. One of the monuments of art nouveau book design, it includes ten illustrations not in the first two-volume edition of 1893. 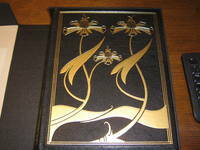 Beardsley was only twenty-one when he completed work on his masterpiece.Covers a little marked and rubbed at hinges. Corners a little rubbed. Free endpapers a little darkened and spotted. Pastedown a little spotted at edges. Very good. [London]: [J.M.Dent], 1909. Second Beardsley edition. Limited to 1500 copies. With slight wear and slight spotting to the cover gilt, actually quite a nice copy. Second Beardsley edition. Limited to 1500 copies. 4to. liv, 624p. 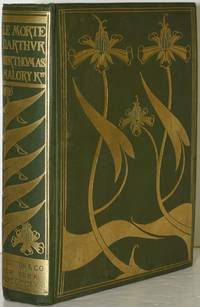 Bound in green cloth with designs in gilt by Aubrey Beardsley on the upper cover and spine (as in the 1st and 3rd edition), t.e.g. Illustrated by Aubrey Beardsley with 16 full-page and four double-page illustrations, 43 borders (some repeated), with ten additional chapter headings omitted from the first edition, initial letters, and ornaments (many repeated). We find this second edition harder to find than the first or third editions. Lasner 22B. London: J.M. Dent, 1893. First limited edition thus. Half Morocco over Marbled Boards. Very Good. 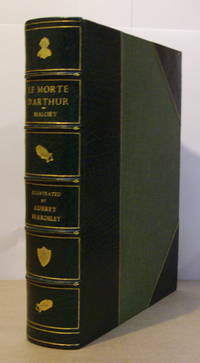 One of 1,800 copies that made up the original issue of this classic version of Morte D'Arthur. 4to. xc, 990 pp. Joints rubbed, with repairs in each volume. Some wear to red morocco besides. A tad of darkening to the spines. Still a handsome binding. The pages are age toned. J.M. Dent, 1927. Edition of 1600 copies. Third Edition. Black cloth with front board and spine. Small spot restored at head of spine and the board corners lightly bumped, a well kept and very sttractive copy otherwise. Top edge gilt, other edges untrimmed, board edges bevelled. Illustrated by Beardsley in black & white. . Hardcover. Near Fine. Illus. by Aubrey Beardsley. Quarto. E. P. Dutton / Dent. Very Good+ in Poor dust jacket. 1927. Hardcover. Note, title page text appears without punctuation. Third edition of this design limited to 1600 copies. Dent colophon on title page with Dutton shown as publisher on copyright page and spine. Small wrinkle to fabric on upper spine. Jacket is tattered and in two pieces but is a rare addition to the volume. This is a beautiful work with wonderful illustration. ; 4to 11" - 13" tall; 538 pages . J. M. Dent & Co., 1894. Book. Illus. by Beardsley Aubrey. Fair. Hardcover. Volume II only which contains books VIII to XI. Must be the superior edition as the dent logo block to the title page is coloured red but no edition page. Also page edges very deckled. Hand made paper. Covers look as they may be rebinds as they are not the decorative gilt cloth boards but plain buckram cloth covers. Back strip of spine is almost detached with heavy chipping. Covers quite tanned and marked. Corners bumped. Hinge cracked inside front cover. Gift inscription to front end paper. Pages 291-664. 5 full page illustrations (including frontis.) + 2 double page illustrations. Illustrations browned. Light foxing to a few pages. .
London: J.M. Dent, 1927. Book. Fine. Hardcover. Original cream vellum with gilt floral decoration. Sheepskin spine titled in gilt. Limited edition of 300 numbered copies. This is no. 138. With a foreword by Aimer Vallance and a note on the omitted designs by Rainford Armitage Walker. Decorative woodcut initials. Contains the 11 chapter headings omitted from the first edition, the Merlin illustration, a (tipped in) sketch for a cover design that was not used and the cover design for the original issue in parts. 45,(2) pp. 26,5 x 21 cm. A very fine copy. .
LONDON, FOLIO SOCIETY, 2003. LIMITED TO 1000 NUMBERED COPIES, THIS BEING NUMBER 991. 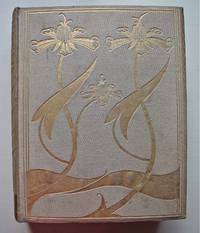 A FACSIMILIE EDITION, ILLUSTRATED BY AUBREY BEARDSLEY, BOUND IN FULL BLACK GOATSKIN, GOLD-BLOCKED WITH THE DESIGN OF THE 1927 J M DENT EDITION. GILDING TO ALL EDGES, HAND-MADE PAPER, 624 PAGES, 11.75 INCHES BY 9 INCHES, HOUSED IN A MATCHING BLACK SOLANDER BOX, SEPARATE BOOKLET WITH AN ESSAY BY PROFESSOR A EDWARDS. A VERY FINE COPY. J. M. Dent & Co. Book. Illus. by Beardsley Aubrey. Fair. Hardcover. Volume III only which contains books XII to the end. Must be the superior edition as the dent logo block to the title page is coloured red but no edition page. Also page edges very deckled. Hand made paper. Covers look as they may be rebinds as they are not the decorative gilt cloth boards but plain buckram cloth covers. Back strip of spine missing. Covers quite tanned and marked. Corners bumped. Hinge broken inside front cover. inscription to front end paper. Pages 665-990. 3 full page illustrations (including frontis.) + 3 double page illustrations. Illustrations browned. Light foxing to a few pages. .
London: Dent, 1927. hardcover. very good. Beardsley, Aubrey. Embellished with a profusion of original designs by Aubrey Beardsley. Introduction by Professor John Rhys. liv, 624 pages. Very thick 4to, rebound by Bayntun in 3/4 brown morocco over marbled boards (well-rubbed but sound and with dampstains at feet of covers). Uncut edges, t.e.g. London: J.M. Dent, 1909. Overall a very good copy, internally clean. 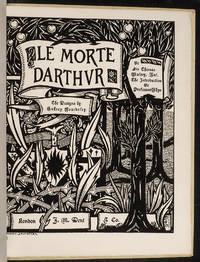 This, the second edition of Le Morte D'Arthur with Aubrey Beardsley's designs, is limited to 1500 copies. 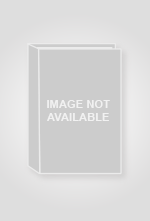 It incorporates additional work, missed from the First Edition. Title on spine reads: "Le Morte d'Arthur". Westminster: J. M. Dent, 1909. Second Edition. Hard Cover. Very Good binding. 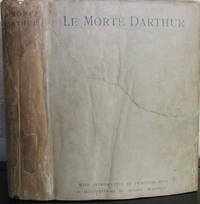 Second Edition of Le Morte Darthur with designs by Aubrey Beardsley; first issue complete in one volume; limited to 1500 copies. Collates complete with twenty engraved plates, of which five are double page. Beautifully engraved initials, borders, and illustrations throughout by Beardley. Altogether a delightful work. Provenance and editorial notations in pencil on the front endpaper, flyleaf, and a page of the introduction. Else no marks. Minor shelfwear. Faint foxing to endpapers, otherwise a bright textblock. Green cloth with lettering and elaborate decorations stamped in gilt, still bright. Top edge gilt. Very Good binding.